This is a discussion on FIFA 17 OS Community Sliders within the EA Sports FIFA Sliders forums. Welcome to the FIFA 17 Operation Sports Community Sliders thread! We had quite the time last year in trying to get 16 to play right. The goal here is to figure out the issues early on, address them, and move on to some actual playing of FIFA 17. The format below is how we're going to approach things this year. It's the only way to get many voices heard, and the community staying on task. With so many opinions and priorities, it's going to be the only way to stay on the same page. Slider sets will be updated on the OP as we come up with an agreement to proceed. This OP will be updated regularly, so please check back for updates! PLEASE DO NOT POST YOUR OWN SLIDER SETS. WE ARE A COMMUNITY AND EACH INDIVIDUAL IS CONTRIBUTING TO THE SET, AND THE TESTING OF SAID SLIDER SET. PLEASE CONTRIBUTE RELATIVE TO THE SET - IT WOULD BE MUCH APPRECIATED. THANKS. GK 98/98 - usually it's just 50, but I'm testing the GK aggression to see if they get out of their 6-yard box more often. Something that has been plaguing FIFA for years. Mark 68/68 - builds that resistance, and means more variety. RF 1/1 - my favorite because the runs off the ball are much more varied, and reduced in length. Width 52/52 - want a tighter midfield. too wide, and there isn't any. FB 100 - gets more variety and CPU tries to catch you off guard. FT 65 - personal preference. Sprint 50/50 - Helps the CPU being dispossessed because the increase in speed means an increase in reaching another player, and thus a better chance of losing the ball. Shot Error 50/50 - more chances, needs more goals, simple. Pass Error 52/52 - Love that this works because the CPU will use all sorts of variety, and without the notion to drill pass every single time, due to the pass speed at 30, they have to find other ways to create chances - and they will - and they will keep you on your toes. Shot Speed 51/51 - Bumped this up because GK is now back at 50, get those slight deflections back and a chance to score a screamer once in a while. Pass Speed 45/32 - Bumped CPU pass speed to 32 from 30, and it's still maintained the proper speed in passes, with the occasional drilled pass once in a while. The FT control allows these type of passes not to be perfectly controlled, then add on the proper positioning via the line settings and marking. Kudos to everyone who tested the values of 32 and 33 respectively. The thought process with 32 is that the better teams/players will have a bit more tendency to drilled pass, but definitely not at the same tendency, or speed, as anything higher than 35. GK Ability 50/50 - No need to go super low on GK anymore since they dive underneath the flight of the ball on shots on all values. 50 has been best, but that doesn't mean they won't do it on occasion. Marking 49/54 - With increase in length, we can afford to lessen the marking value. Big kudos to @andanesean for suggesting lowering the user's marking under 50. The HLW makes up for the lack of marking values, but also allows the CPU to play with a lot more variety in their attack. Height 65/65 - Evened out height as 65/68 didn't really show too much, other than more off the mark defending on more on more than one occasion. Length 48/50 - Discrepancy now makes the CPU much more of a threat going forward, but still maintains overall shape. Width 54/53 - Discrepancy to compensate for the length increase. Want to make sure not so wide that defending players do not remain goal side, but not too wide where players aren't running into the box. FB 68/68 - Previously 80, with the length at 45 it worked, but now that we've increased to 48/50 length, this value can take a bit of lowering. I'd say lowest value is 60, maybe something in between at 65 or 70? Think 68 is perfect. Good variety and nice to get proper counter attacks working. FT 65/65 - Lots of love for 65, don't see any real reason to lower it. - The concept originally with the increase in shot error was that we started seeing the CPU pass the ball around the box a lot more, versus just first time shots like crazy. Due to the increase in marking, making the pitch a bit tighter, the score-lines started to lessen in the 1-0, 0-0, range. - Why 49? What we discovered was that the CPU still shot wayward, especially in the lower leagues, but most importantly, the GK was able to locate the ball correctly. What was happening on 50 shot error is that the GK would not locate the ball in the air, so he would either A) dive below it's flight path, or - and even worse, would B) he would locate the ball too well, resulting in backward save animation (where the GK jumps backwards to save the shot). - Now, if you increase shot speed, then you will have to test on your own in relation to what GK value and shot error works best with what you've chosen. We have tested Shot Speed on 48, and it's been the collective agreement to stay there. - Kudos to Velo and Balla for testing the pass error in scales from 70 (max threshold) and below. We want to maintain the control and physicality, while also making sure the ball is still a separate entity in the pass department. - *Note about pass error* - it is our approach to use FT at Zero, that we had to find a value that was going to make the ball "bobble" (bounce up an down on the pitch, relative to skill level of team used), and we discovered that Pass Error resulted in the animation of the ball bobbling on the pitch. From there it was about seeing if the pass error affected the FT Control at zero, and as a result, it absolutely did. The animations look like a FT Control of 50 to 60, it allows top players to still stand out, and lesser players to really feel like lesser players. We believe this is also why when you player a lower league team, and you as a top team, it will actually feel that way, versus just being dominated against a lesser side. The opposite occurs to when you play against a similar top team, they will play like a top team as well, instead of the overly cautious and lackluster challenge that tends to happen in FIFA. - 78 is our "ol' reliable" value from Set 2, and makes another appearance here for testing. The absolute key with this is ensuring the defensive line is meeting the forward/attacker in proper spots, but also brings out the FB to meet the wingers. - Before, the forward gets the most touches, and it's not playing like a point man, it's more so receiving the ball, turning and facing goal, sometimes also seeming like he's a CAM. - The length increase is serving two purposes. The referee tends to "look away" on lower lengths, you can watch him in replays and see that he will look away from physical interactions, thus missing calls, etc. I've seen it where he will consistently look at the GK instead of the middle of the pitch, where the altercation occured. As length was increased, this spreads the pitch out a bit for the referee to isolate these physical plays, and deem them as fouls or not. Pitch compression and decompression. I preach this all the time, but the length of the pitch is essential to getting the players away from eachother, and closing eachother down appropriately. A CB should be able to send a long ball over the top to a forward, and a FB should be able to send a ball down the sides, into space, without worry that it's going to fly 30 yards past where the forward is. I am a fan of a compressed pitch, but that is only if proper numbers are built, it can't be manufactured to be the main concept. Yes, FIFA needs more of it, but because of FIFA's tendency to all-out attack, reduces those numbers from being properly built up. This is why the other values, such as RF at zero, are utilized as a solid set up. Pair that up with the length, the marking, and you've got a bit more of a midfield than before. 50/51 - placing the CPU players past the user allows players to stay in front of the receivers properly. FIFA struggles to get bodies in front of receivers, thus having no appearance of a player able to cut off passing lanes. This is why it seems that interceptions are caused from only wayward passes, versus forced, close quarter, passes. - Just a very slight increase here to get the FB meeting the winger, and not swapping with the CB as often. Because there is a length difference, the width can remain the same, which will help create the look of a width discrepancy. The reason a width discrepancy has been used before is to maintain the FB staying goal-side defensively, and not veering into the sidelines, or over-committing their positions too sharply. - The most important thing here is to ensure the defenders stay in the attack on corners, and set pieces. The instant-retreat on loose balls seems to carry over from 14,15 and 16, into 17 post-patch, so the FB positioning at 100 has been helpful in keeping those defenders involved. - The caution with raising it this high was that the FB's would constantly be exposed, but this has not been the case. The other side of things it that we were worried the FB would take over the outside mid/winger's spot, but that did not seem to be the case at all. - To be honest, the feeling of 50 to 100, relative to the FB's positioning up and down the pitch, does not seem to be different, but the benefits of the defenders staying involved in the attack on set-pieces is promising. - A slight increase here, but Velo tested 3 matches with it and it has significantly reduce the first time shots from the CPU. Much more build up at the top of the box, and makes for some varied play from the CPU in the defensive third. Does not remove shots in obvious positions either. - Velo's favorite, and mine too. Seen some amazing shots with this value, some great "velocity" as well. Go figure. Don't worry, it's not too slow. - Still testing, of course, but higher GK usually results in more aggression. Noticed on other lower values that the GK would try to save "below" the ball's flight. Also want to get these keepers out of their 6-yard box when it calls for it. - This slight increase has now allowed the midfield to come into play further. At 48, it was still very easy to get through the midfield for both user and CPU. In addition, the attackers weren't met by the defensive line soon enough, which allowed them to turn and face goal much easier than they should. - This value could go down further, but the lowering of FB is relevant to the height chosen at 60. The FB's already go up the pitch quite a bit, regardless, so lowering FB will now allow them to still go up the pitch, but not be completely exposed in transition, or counter attacks. This seems to be why a lot of the CPU's attack is aimed to be more direct, however, it still needs a bit more testing. Still trying to find the threshold that will allow the FB to play properly, but not to the point they don't get up the pitch at all. - Hear me out here. The test was to try to fix the CPU's "kamikaze" dribbling, as balla puts it. It was also to see if the first touches were still off the mark. I was not as optimistic, but was very surprised to see that not only had the dribbling right at the defensive line stopped, but the touches were off the mark as well. I feel this value "cancels out" any slider input, and goes to actual true ratings. This could be way off, but I've posted 2 videos already and it has already shown promise. Multiple guys have tested as well, and reflect the same conclusion. Can the value go higher? It hasn't been tested, but it will be looked at. However, at the moment, it looks and feels great. I added on to some of the Tweaks, will update the OP. Thanks, everyone! Thanks to everyone who joined the stream earlier today. There are a couple things with Set 3 that are standing out for me. I want to implement Set 3 Tweaks #1 right away. - I want to improve this. So thanks to @lshballa11 for a suggestion of actually decreasing pass error from 60 to 50. What this actually creates is more room for variety from the CPU, and given the right FT Control value, and HLW values, the CPU plays a fairly dynamic game. There is also the testing that the lower pass error also shows some added benefit in the physicality department for the CPU, however this cannot be isolated or proven, as we did extensive testing on multiple value ranges. 2. HLW Settings - *10/10/16* Thanks to @AppleofEden for testing line discrepancy. This seems to cause the DAA a bit more, so it may be best to reduce any kind of discrepancies. Adjusted. Pass Error from 60 to 50. - From the current HLW, the length is the main stand out for me because I am seeing an instant retreat animation from the players. I believe this is because of the lower length. The reason I believe this is because FIFA has a tendency to maintain shape very well, now when the field is decompressed (Extended) the priority is to get into a defensive shape in transition. The problem with this is that it happens too fast, and too automatically. - Height - 60 - Stays the same. This height has brought the best balance of the CB's joining in the attack (past the half) and also able to drop back when the ball is deep in the defensive third. It also allows the defensive line to meet the attackers, and the midfielders when called upon. - This adjustment will allow the pitch to be extended, and not force the animation of retreating to be instant on transition. This will also allow the CPU players to get into the box a lot more naturally. The benefits of this will be full field coverage, and allow any stretch of the field to happen naturally. It will also allow the CPU to provide all sorts of variety that is at their tactical, and match scenario, disposal. - The theme that will be critical for FIFA 17 slider adjusting is the maintenance of keeping width below the value of length. The reason the shape in Set 3 is well intact is because the width of the pitch is utilized as a response to the middle of the field being well positioned, defensively. As length is increased, naturally the width of the pitch will as well. To counteract this, the width lowered will continue to bring in that good, Set 3, shape, but now from a much more extended point. This brings in the numbers to be built into the attack, and the defending team to get numbers behind the ball. It also allows quick counterattacks, or clearances down the field to anticipating forwards. I'm going to try to reign this back in and provide a New Set. Please keep in mind, we all play differently. Adjust to what you see fits. Please know that adjusting is inevitable. This isn't a "catch all", sliders are never a specific set, they are a BASE. I'm calling this Set #3, which combines Set #2 and Holiday Set Remake, and various other values that have been suggested. First, some general comments. Based on feedback throughout the already 130+ pages of this thread, these are the top things I know we are looking for. CPU challenge is there, but bursting is an issue, I can see the 2 pt discrepancy is a hit or miss for the majority of feedback, but it seems to be the absolute best way. I would suggest we test 50 accel for the CPU and whatever accel value you want, 48/50 or 49/50, again it's relative to marking as well. Like I posted last night 5 fouls by the CPU alone, Holiday set, in a 10 minute match. Tested the same thing on default and had the same amount of fouls. It's all about the game recognition of collisions. The CPU doesn't go "through" as hard if acceleration for them is lowered. Another thing is I believe their FT control has to be 1 above the user, so I'm using 50/51, so they do not have as good of a foot-to-ball ratio and more foot-to-foot. Yes, referee matters in terms of advantage play vs calling the foul right away. Run frequency matters as well, and so does marking. Too passive and you can burst through, too tight and you can see wonky defending. The key is finding the proper compression and decompression of the lines. Football is not just about a half-field match, it's full field. It's about numbers being behind the ball that create that half-field scenario, but it can't be created with constant end to end action. This is why Set #2 works in regards to run frequency and marking. There are not that many runners off the ball IRL. It is a gradual movement of either showing to the ball, or slightly moving into space. When the CPU becomes too clinical and connects on 6-7 passes as their attack, with no hesitation, that becomes a problem. We complained about it so much in 16, and previous years. CPU doesn't play with enough variety. This year though, they seem to be more in tune with their variety than the last couple of years. The important factor here is determining values that do not take away from the variety to show up. There are some values in play here such as run frequency, marking, but the most important one seems to be Line Length and Line Height. Too low (under 45) and the CPU is afraid to go offsides, too high, well too high isn't terrible, but that spreads out teams too far and only very high accelerations would keep the physicality in check. I tested on 60...55...52...51 last night and, in terms of variety, it is nice, but again that's relevant to other values as well. So the balance here is finding the proper length that compresses, and decompresses the field of play. There needs to be room to send a long ball up to your forward (who is beyond the half-way line) or to create a ball into space. There also needs to be more tightness to create that midfield of Set #2. So with all that said, here is Set #3. I'd like to keep feedback on Set #3 please. If you do adjust something, please explain what and why - and how it relates to the set. Sprint Speed 49/49 - @Velocityy - 50 Sprint was a bit high and the CPU would tend to just sprint right at the defense, with no regard of the midfield. This seems to have lowered those occurrences. Those of you that hate the Jogging Animation , feel free to adjust accordingly (increased Sprint should lower the jogging animation from appearing, although it has not been thoroughly tested in 17). Shot Error - 52/52 - @Matt10 - This is all personal preference. Adjust depending on your match minutes. Pass Error - 60/60 - @Josam27o7 - The best balance of efficient passing and pass variety, with a mix of bad and good. Humanizing the CPU is key, as always. Crosses are fine as well. Shot Speed - 49/49 - @Matt10 @Velocityy - The way the ball gradually rises on shots is really nice here. You can score some absolute screamers, but depending on shot error, you can also score some dribblers. This helps the keeper animation of saves as well. Pass Speed - 40/40 - @Matt10 @Velocityy - Personal preference again. Adjust as you see fit. Pass Speed is relative to the distance the pass needs to cover, and run frequency determines the receivers collecting the ball. Remember, the CPU will use a driven pass, relative to the Pass Error. Driven passes range from a bottom range of 60 when Pass speed is on 50, and reach speeds up to 80. So, by lowering the pass speed you now get a good mix of pass speeds that can reach a max speed of 60, then you take in the pass error and that introduces the chance of that 60 speed of pass to be less accurate - as it should be. Injury Frequency - 50/50 - Untouched. There is discussions of the most recent squad update fixed the injuries, this still needs to be looked at. Injury Severity - 50/50 - Untouched. There is discussions of the most recent squad update fixed the injuries, this still needs to be looked at. Goalkeeper Ability - 50/50 - @Matt10 - With shot speed lower, it actually makes keeper saves more natural. Remember though, GK ability is also the aggressive level of the keepers. Also, acceleration controls the GK's movement as well - so tread carefully with adjustments. Run Frequency - 5/5 - @Matt10 - Taking this from Set #2, as it produced the best midfield. IRL you usually do not see more than 2 runs off the ball (full length runs). There is a lot more checking to the ball or gradually jogging into space. This also keeps the marking in check. With too high of a run, the CPU defenders get confused and do all sorts of things that are not logical. The goal is to limit their ADD (Attention Deficit Defending, when defending players go and mark the player without the ball, as if they are the ones who had possession, bursting is usually the product of this, but not without DAA). Line Height - 60/60 - @Matt10 - We've lowered this because with the increase in length, from Set #2, there needs to be room for the midfielders to still drop back, and not be "pushed" out of position. This creates that half-field approach when numbers are built up. The marking value also brings the defenders to be in the back of the attackers, and the attackers post up. This also helps the midfielders to post up in certain positions as well. In addition, the chance of offsides are stronger, not to mention more pass variety and clearances. Line Width - 52/52 - @Matt10 - With length lowered, that means there is much tighter spots, and to a fault because too close means a higher chance of wonky positioning. Width is increased here to make up the difference of a lower length from 50. Full Back Positioning - 0/0 - @Matt10 - This is very key. I tested default sliders at multiple zero values, especially FB, and regardless of run frequency, the FB's still go up the pitch. They are controlled by a combo of height and length. The good thing about this value is now that they do drop back slightly when they are out of the play. They will tuck in, versus stay way out wide and not doing anything for the offense - but making the defending outside midfielder tuck in more. First Touch Control - 50/51 - @Matt10 - So this one is still a WIP. The concept/theory here is that if the CPU is 1 point up in error, that reduces their foot-to-ball ratio, which means more tackles/fouls, especially with the CPU acceleration at 50. Again, it's always personal preference, and you can adjust to what you feel is solid. I would say play to the differences of this value, relative to the acceleration value of 50. So if you have accel at 47/49, use a differential of 3 - so it would be FT 50/53. Again, this is just a very early concept/theory - that needs some testing. Thanks. Please do not post full slider sets. I don't want what happened last year to happen here. It seems we're all on the same page with what we want, but we have to stay organized. I've also seen posts about BAP/Player Lock. If you use this set, please advise what was necessary to be changed. I personally have not tested in that mode, so this Set, or any previously, have not been intended to be applicable to those game modes. After testing the majority of last night, and a bit in the morning, I have determined that marking needs to go down. The number that makes the most sense is 52. I determined it being 52 by starting to burst from kick off, and seeing how soon the midfielder engages. This is not an arbitrary number, but is one that will work best with the Current Set #2. It would be different if you had HLW different, not to mention run frequency and FB Positioning, etc. So relative to Set # 2, marking at 52 works the best. I was reluctant to drop from 78, but the animations I started seeing were reminding me of PES' "freak out" defense", which made huge gaps in the defense open. Listed below are the requested tweaks to test. I am still looking at other values, simply ran out of time. Will be on again later today around 4PM CST. - Less ADD (Attention Deficit Defending) by defending team. - I felt with the higher FT that the game just went into overdrive, very fast-paced, no additional physicality either. It seems as the FT is lowered, the CPU "tries" to actually get the ball and has a good chance of making a good tackle or bad tackle. The decrease of Marking should assist in this. Please test openly as I know there is a preference for higher FT, but I've learned we need to be more open to making changes that are away from our slider comfort zone . - Good crosses from CPU, more build up from CPU. - More dynamic shots, speed, rising shots, good variety without adjusting shot error. - Felt this was a bit of a placebo as the DAA continued to show up. - Acceleration discrepancy, 47/49 (Josam27o7). - Could help more with bursting, some physicality. Good feedback so far. - FT Control 99 (Rachel93). - More realistic touches dependent on skill level, more stand out by stand out players. Personal preference, but something to look into as it is gaining momentum. - Decrease injuries, but also helping the DAA (Defensive Angle Animation) which creates bursting chances. Not completely eliminated, but better. - Width discrepancy 62/65 (Velocityy), increases chances of offsides and keeps midfielders tucked in defensively. Also much more variety. Needs more testing. - FT Control 99 (Rachel93), more realistic touches dependent on skill level, more stand out by stand out players. Personal preference, but something to look into as it is gaining momentum. Sprint Speed 50/50 - @Matt10 - Keeping it very simple here. Adjust as you see fit. Acceleration - 48/49 - @Matt10 - Slows down the pace of play without making it a complete bore. Players will feel like they have weight to them. If you feel like it's too sluggish, go to 49/50. Bursting (video @30 sec mark - where a player is able to sprint ,untouched, through the entire midfield and defense), can occur on many settings, and many combos of them. This is still a continued siege of experimentation to combat, but right when we think we have it - it shows up. It is most prevalent on kick-off, passing off to the winger, then sprinting diagonally from outside to in. I am not 100% sure of what the value should be. This needs the most attention. Shot Error - 52/52 - @Matt10 - This is all personal preference. Adjust depending on your match minutes. I personally use 55. Shot Speed - 52/52 - @Rachel93 - Tested this for a little bit and absolutely loved it. Makes keepers perfect saves a thing of the past, and their reactions to shots on their goal quite realistic. Again, this is a personal preference. Goalkeeper Ability - 50/50 - @Matt10 - Best balance as too low and the GK will dive lower than the ball's height. Interested to see feedback on this value relative to Rachel's shot speed. 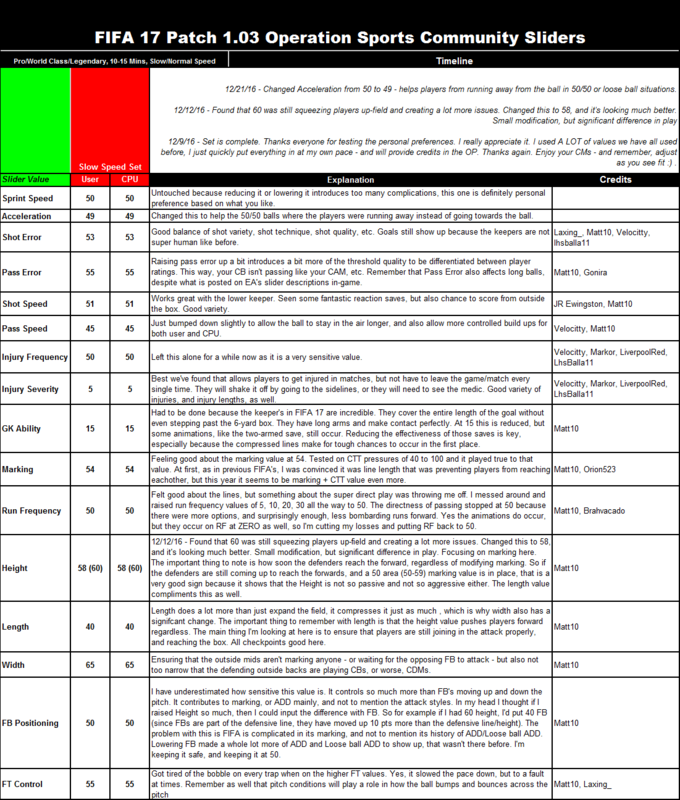 Run Frequency - 25/25 - @lshballa11 - Changed our stance on this after testing it. Loved the types of runs we're seeing. Opens up the game, but not in a bad way as long runs can be covered just as well as runs that are check-to runs. Line Width - 48/47 - @Matt10 - Dropping marking to 60 lets this width and length work correctly. The shape of the midfield is very good, and it gives those outlets for wide players. Full Back Positioning - 20/20 - @Matt10 - FB's still get up the pitch at a good rate, and serve well as the outlet for the congested middle of the pitch, if needed. Works well that they aren't push so high that the CB's don't spread out to cover the transition. Here is Set #2. Worked on it all night, it was "found" while streaming last night with a couple guys on Twitch. Nothing but positive. Yes, need to work on getting the foul count back up, but man, it's playing great. Word of caution: This is a set that is geared around trying to make the game more start and stop. Not in the terms of fouls, but in the terms of attention to defending, and what kind of reactions that results in. Teams will play the way they are designed, which means offensively and defensively. The fact that we can get such a variety in this though, is really making me love FIFA 17 more. Sprint Speed: 50/50 - Started at 52, but physicality stopped. With a tighter set up, it's important to make sure physicality remains intact. This seemed to have helped, although jogging animation does show up - but in later parts of the match, and not consistently enough to warrant a change. Acceleration: 49/49 - evened out, if bursting occurs, try 49/50. Under 50 accel feels much more controlled though. Shot Error: 52/52 - With a tighter set up, there are less chances, so this is key in getting more shots on frame, and from distance due to the HLW combo. Pass Error: 60/60 - What a difference 2 pts make. Players will be forced to perform under pressure. Bad passes are punished, and passes into space are back. Pass Speed: 45/45 - increased this because the ball needs to move a bit more crisp. Paired up wtih the higher pass error, and it works nicely. GK Ability: 45/45 - no change from Set 1. Marking: 78/78 - no change from Set 1. Still the best balance of zone and man marking. Run Frequency: 5/5 - still a good mix of runs off the ball, but not always running away from the ball carrier. More checking to, even from the midfielders. Line Height: 65/68 - anything below 60 and it's just too passive. It invites pressure, and the defenders turn their backs, chasing players around the box. This also allows the back line to help in the attack much more. Also, taking a bit of a page out of Set D from FIFA 16 Sliders we did with the height discrepancy. This actually pushes the CPU a tad further up, squeezes them a bit more closer, so there is still a player in front of their players, and vice versa. Line Length: 40/40 - Biggest difference, but biggest impact. This brings everyone closer, as expected, but doesn't nullify variety in the slightest. This makes players check to the ball even more, and have their backs face goal due to the marking. Line Width: 70/70 - Key in keeping the shape intact. The midfield is where I saw Set 1 start to lose its grasp on realism. It was so easy for the CPU to glide in and make 1 or 2 passes, and be deep into the defensive third already. This evened out width, in combo with the other line settings, puts alot more emphasis in creativity and defensive responsibilities - without running around like maniacs. Fullback Positioning: 60/60 - as length and run frequency decrease, FB positioning has to do its part to overlap the runs. The FBs do not overtake the midfielder either - which is one of the great things about FIFA 17 this year. This also keeps the FBs more in touch on transition. *Notes: We did not expect to have a set out so soon, but the majority of the time was working on managing bursting. It's definitely not 100% fixed, but it's better than where it was before. Big thanks to my good friend, @orion523 , for finishing up this set - and adding his expertise. Pass Speed 40/40 - Lowered as a consensus that it's too fast on 50. Marking 78/78 - Similar to 16. Marking at 79 & 80 is too tight, to the point players will not ever release. 78 is perfect, and also allows much better angle into the ball, but only with the below settings. Length 51/48 - Started at 51/51, and moved just the CPU's lower. The CPU has to stay "in front" of the user's midfield, and give time for the defensive line to react. I just stopped at 48, for now, so if you do start to see the animation below (defensive angle animation) just drop the CPU's length gradually down. Notes: Here is a screenshot from my last streamed match. Considering the changes were not to any "error" values, I'd say it's a good sign to see that many fouls from the CPU. That means the physicality is there, and the CPU is "meeting" the USER's players better. Notes: Bursting is a product of the poor defensive angle taken by the CPU. This animation cannot be completely removed, but its effectiveness does seem to be lessened when lowering the CPU's length. The problem is the CPU stops "caring" as you get deeper into the sprint, especially the backline. For now, let's get some info on how you guys get on with Test #1.
jawiebold, BucksInSix, ballin095 and 31 others like this. Last edited by Matt10; 07-17-2017 at 11:13 AM. I think the goal for this thread is simple: 8 patches + 12,000 replies + 2,000,000 views. BucksInSix, SteveFBC, Aquaman_OS and 17 others like this. GiantFrank, Billy Batson and OliDegu2008 like this. I personally hope the game is fantastic out of the box so we don't have to spend half a year fixing it. Half a year? Check your math, lol. That would imply we (you) were finished in March. Well Matt if you can get it playing any where near as good as you have 16 playing right now it will be awesome. Fingers crossed we dont get another 6 patches. bad_philanthropy and Matt10 like this. I took a quick look at the settings and didn't see any sliders in the demo. Are there gonna be sliders in 17? Did I miss something? It's completely possible that I've overlooked because I only booted up the demo once so far. Demo didn't have them, but the full game does. I just played around with them. So far guys, the game plays differently in CM than Kick-Off, as expected. I changed the following and it was instantly better. I also did a personal preference of 55 shot error for both. 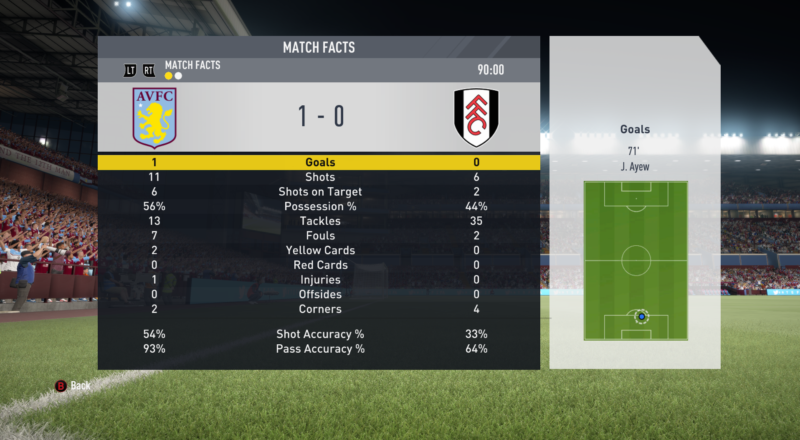 I saw the CPU shoot from distance, and still bag 3 goals against me. Pretty awesome couple of games tonight. Of course, it's brand new, so we'll see how it goes through the progression. Entiae and JHedges2 like this.